Fall Layers on a Casual Halloween Sunday. So we went from a high of 68 degrees day on Saturday to temperatures 20 to 25 degrees lower on Sunday. That nice weather was perfect for Saturday too, since I attended a wedding. But today I am back to wearing several Fall layers and keeping it as casual as possible. 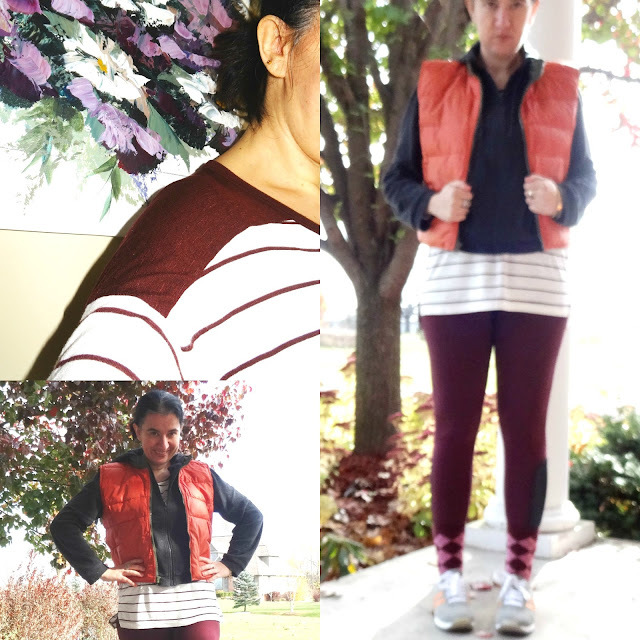 In honor of Halloween weekend all of my layers are topped off with a Bright Orange Puffer Vest which matches the strips of orange on my Gorgeous New Balance Sneakers, but there is also a pop of pink for Breast Cancer Awareness month, in my socks. 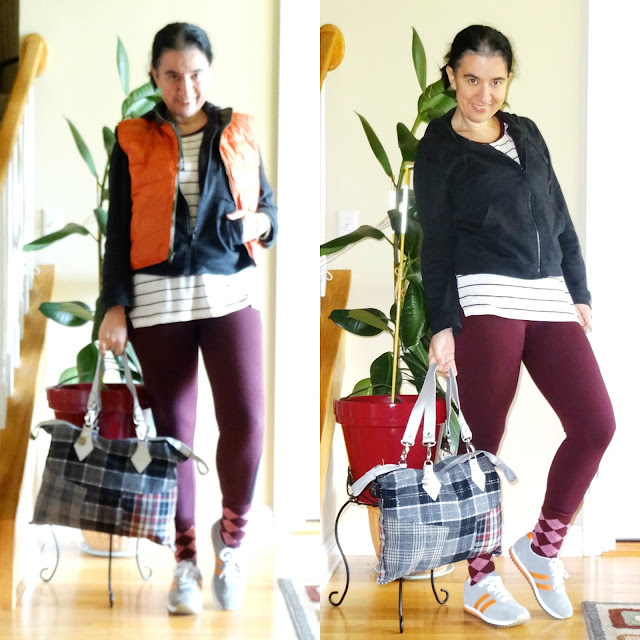 However the two main colors of this outfit are burgundy (tee, leggings, socks and a little bit on the bag) and gray (hoodie, bag and sneakers). There is also some pattern-mixing between the stripes, plaid and argyle. This outfit definitely has a very relaxed athleisure and sporty vibe to it, no? And I love that. So, how did I layer? 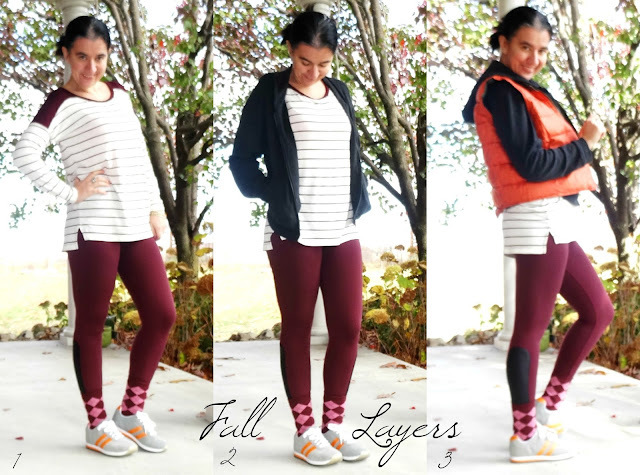 1) Striped tee over leggings and socks worn on the outer side of the leggings. 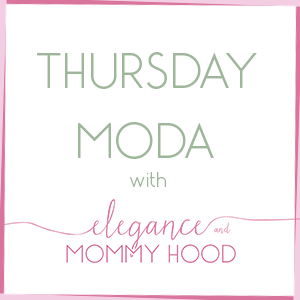 2) Zippered hoodie sweatshirt over the tee. 3) Orange vest over the hoodie which was zipped. For more explanation, see the collage right above. The three layers on top worked because they all have different length and are in different materials, too. 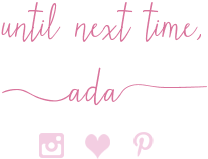 White+Burgundy Striped, Loose Tunic, Long-Sleeve T-Shirt: Old Navy (similar, baseball style, Huge Steal, love this), (similar, Great Deal, my Favorite), (similar, Splurge). Choarcoal Grey Zipper Hoodie: The Limited (Old) (very similar, Splurge), (graphic option, Steal), (similar in light grey, Fantastic Deal), (similar laceup style, Great Deal, my Favorite). Irreversible Orange Puffer Vest (it is olive on the other side): Urban Outfitters (Old) (similar, Huge Steal), (similar, Great Deal, my Favorite), (similar, Splurge). Burgundy, Equestrian-Style Leggings w/ Faux Leather Detail off the side of each leg: Penti (similar, Huge Steal), (similar coated option, Fantastic Deal), (dressier option w/ zippered pockets, on Huge Sale), (similar athleisure-looking, my Favorite). Burgundy+Pink Argyle, Mid-Calf Socks: Gap (similar, Huge Steal), (similar, on Sale, love these), (similar multi-colored option, my Favorite). Gray+Black w/ Red Patchwork Wool-Blend Tote Bag: Lulu (similar, Huge Steal, love this), (similar, on Sale, my Favorite), (similar, Splurge, love this). Grey+Orange Striped Real Suede Sneakers: New Balance (New) (similar current NB option, Great Deal), (similar Nike's, Fantastic Deal), (similar, love these), (similar, Splurge, my Favorite). Last year also in the Fall, I paired the same leggings and striped tee as today's outfit but for a more dressy look pictured below. Which one is your favorite? This year's or last year's? What plans do you have today for Halloween? I will be taking my little butterfly trick or treating, of course.